Apologies if this has been addressed already (I did a quick search of the last 6 months and did not find a match), but I am brand-new to DVD Profiler, and as I'm looking for a good solution to track my media collection, I thought I would give this one a try. When searching for a solution to this problem the site directed me to get the DBRepair tool, which I downloaded and ran, but it didn't change anything. I also tried different layouts, thinking that perhaps it was just a visual issue, but I'm not seeing this to be the case. I'm hesitant to proceed any further with entering titles if the total count is ultimately going to be wrong. Has anyone else encountered this specific problem, and if so is there a way to fix it that I'm just not seeing? I may have found the solution. What I did was edit the title, and under Personal Information, I changed the "Count As" value to 0. This changed the total number of discs from 8 to 7. But this brings up a new problem. I would like to get a count of the total number of TITLES I own, not the actual number of physical discs I own. Is there anything in place to display that? I would like to see (for example), Titles: <title count>, Discs: <disc count>. I know disc count works and is there, but is there a title count? You would need to need to use the count as field to reflect what you think of as a title. If you want Game of Thrones Season One to count as one title, set the parent to count as 1 and the child discs to count as 0, for instance. I'm amazed at how well this program can be customized. Just wish there were a few more things I could change for myself. Well I posted it as a separate topic but one would be to have custom groupings of titles. For example (probably a better example than what I put in the separate topic) if I wanted to group all the James Bond movies together. I would like to create a custom "parent" title -- James Bond Franchise, for example -- and then have the ability to move titles under the custom parent title. I see that it is possible to have multiple, separate movies under a parent title provided there as a UPC code (for example, Ghostbusters 1 & 2 being the parent title, then "Ghostbusters" and "Ghostbusters 2" as the children titles). But I'd like to be able to do something similar without having a UPC for the parent title. 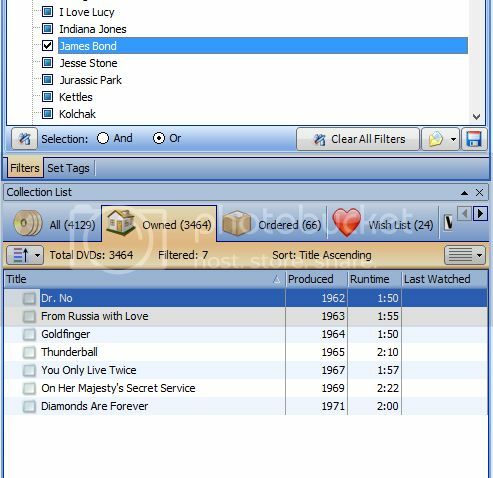 Beyond sorting and grouping titles together, you can also create Tags to filter on specific groups of titles. In my case, I've created a "Series" tag that I use to filter discs. You can already do that. I have a fake profile called James Bond. Under that profile, I have all my James Bond movies. Add a new profile to your collection. You want to Add by Title (sorry, I don't have the program open, so this is from memory). Uncheck the Download from Invelos box at the bottom. Then enter your title and click ok.
At this point you have a brand new profile in your collection. You can name it. Give it screenshots. Whatever you like. Including adding child profiles. This profile will never be uploaded, so you can do whatever you like with it. What's more, this can go n-layers deep. Back before we had Custom Collections, I had a fake profile called TV. Under there I had a fake profile for Babylon 5. Under that, I had a fake profile... You can do it at much as you like and go as deep as you like. I had 5 levels deep at one point.